Once you've taken the decision to go ahead with changing to a dimmable LED installation, what should you consider? One of the most important things to check is that the proposed dimmer works with the selected LED lamp before committing to it. These are examples of poor customer experience that can occur should a low quality design of LED be used, or a mismatch of the electronics between the LED driver and the dimmer. Over the last few years Futronix has provided many technical articles on dimming LEDs, but here we look at the issue from a hands on perspective. Before selecting any LED lamps or luminaries, choose what kind of dimming you want. Reputable lighting control manufacturers like Futronix, provide lists of LED products that they have tested for compatibility with their equipment. Customers or specifiers should make use of these services. Protocols - the languages which they use to communicate with the lamp or driver. When you've chosen the method that's right for your installation you will need to buy LED lamps or drivers that match the performance and the protocol. The most common problem lies with the design and build quality of the LED driver, leading to poor performance and even complete failure of the LED. For instance, with a DALI driver it may not be able to dim down to the level that you wish to set. Beyond a certain threshold of dimming, the LED lamp may simply switch off! Similarly, while DMX signaling is ideal for a colour-change installation, only quality LED brands will be able to render the desired colour with accuracy. Most commercial colour DMX lamps use more pure colours to create a wider gamut than is possible with just RGB. Pure colours of amber and white are often added without which the available spectrum may create some poor lighting effects. The old adage of “you get what you pay for” should be borne in mind. Avoid cheap products, particularly of items like LED tape and always check with the control manufacturer that your intended LED product is compatible with their system. In the domestic and light-commercial environment, its very likely the customer will be using phase-dimmable LED lamps. Especially if they are retrofitting existing lamps (tungsten or halogen) with LEDs. This creates cost-effective installations but, being designated ‘retrofit', customers tend to think that just a quick lamp swap is all there is to it. The situation is exacerbated by LED manufacturers who promote the same concept in their marketing and packaging. Being an unregulated market place, it's very important to check that the proposed LED lamp works with the dimmer before committing to purchase. Test before you buy. If in doubt ask the dimmer manufacturer if they have a free testing service and submit a number of samples for risk-free approval. Although safety standards are required in the manufacture of the LED because it's an electrical product, there is no standard based on the performance of an LED. LED products are often made by sub-contractors (OEM) in China and, because each company's brand may have different design parameters and cost points, two apparently similar LEDs can have completely different designs and hence very different performances. LEDs can have higher in-rush currents due to the nature of the power supply built into them. Therefore, it's important to select a dimmer which can cope with this and provide regulated power to the LED. In some cases the load of the LED is too low for stable performance and the addition of a Dummy Load may be required. Retrofit LEDs are intended to replace existing tungsten or tungsten halogen lamps. However, due to the size of the electronic components and cooling components used to alleviate heat dissipation, some LED lamps simply don't fit existing fixtures. But that hasn't stopped some manufacturers making them anyhow! It might make for a better engineered product but, if it doesn't fit into the required illuminare, its not much use. So again, check before buying and, if in doubt ask the supplier. 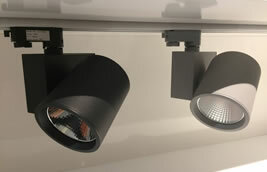 In LED lamps with larger wattages - for example, spot track lights used in retail, or ceiling mounted recessed down lighters - the LED chip is mounted on a dedicated aluminium heatsink, while the circuitry is mounted in a separate gear case. This allows for more component spacing, better cooling and a longer life span. In a retrofit LED lamp all the components have to be contained within the given physical space of the lamps body & base. This can cause thermal and mechanical stress which, combined with component quality, will adversely affect lamp life. Most commonly the first thing to fail in an LED lamp is its internal power supply. It's important to buy a reputable brand and preferably one recommended by the dimmer manufacturer. Not only will a reputable LED brand have performed extensive testing, but the dimmer manufacturer will also have tested compatibility with their product. Additionally, a dimmer manufacturer may have performed a strip down test to check for basic component quality and thermal management of the LED before making that recommendation. GU10 LED lamps are replacements for mains voltage tungsten halogen lamps and are the most popular of all LED retrofit lamps. Because the ceiling mounted downlighter is so ubiquitous the GU10 has become something of a standard within the lighting world both for new and retrofit. A dimmable GU10 lamp is a compact piece of engineering; it needs to house the LED driver components as well as a power supply. If you're looking for a dimmable version, it's all the more important to check with the dimmer manufacturer before buying! The LED MR16 lamp is the LED retrofit for the classic 12V (35-50mm) dichrolic reflector lamp. It requires a transformer that has to be mounted close by usually above the ceiling. As a legacy alternative to the GU10 lamp the MR16 has a few draw backs. Its small body size makes the inclusion of dimmable components even harder, and only a few manufacturers have actually managed to produce a dimmable version. The original transformers used for tungsten halogen may not be compatible with dimmable MR16 LED lamps, so only dedicated LED transformers should be used. Some dimmable LED MR16s come with there own matched remote transformer. This provides the benefit of keeping the heat and power components away from the light source. It's not a good idea to mix LEDs from different manufacturers on the same dimming circuit. Each LED may well use a different brand and model of dimming chip inside its circuitry. Each chip manufacture will interpret the phase-dimming signal differently so that even the same wattage of LED may have different dimming characteristics. Additionally, there may be cross-noise between LED lamps and this can be accentuated between different brands that haven't been designed to work together. The likely outcome will be flickering lamps and differing light levels. It is recommend that one dimmer channel be allocated and wired for one type and set of LED lamps. Usually manufacturers will stipulate an upper level of lamps per circuit. Don't put too many LEDs on one channel as cross-noise even with lamps from the same manufacturer may cause a problem. The message that is heard repeatedly is not to assume and always to check. The days are gone when a filament lamp could be perfectly dimmed with guaranteed performance. Today, electronics speaks to electronics across either an imperfect electrical power circuit or a data cable that may have only been intended for computers! Speak to the lighting control manufacturer. Have they tested the LED that you'd like to use and are they happy to see their equipment connected to it? Consider performing a mockup test yourself as close to the operating conditions as possible. Apply minimum and maximum conditions to determine the acceptable number of lamps within your design. The four dimming protocols are available from all the major lighting control companies. Its worth checking with the manufacturer as you may need to specify which of these you require. Mains dimming is the oldest dimming protocol of all. Classified as “existing infrastructure” it can be seen operating in hundreds of millions of homes, shops, bars, restaurants and other small commercial installations. The system uses the same existing mains power circuit that feeds the lamps to superimpose a signal that tells the LEDs what level of dimming is required. Inside an LED lamp is a chip which is designed to detect and lock onto this standard signal and control the LED's brightness accordingly. Huge efforts have been made by the manufacturers of these chips (i-Watt, Cirrus Logic, NXP, Marvell etc..) to improve performance over recent years and, given the market size, this is likely to continue. However, not all LED's lamps are made equal! As there are no standards, some OEM manufacturers will save a few $'s by opting for older or less smart chips thus affecting performance. DALI (Digital Addressable Lighting Interface) is generally used in office or large commercial applications to provide area lighting control over a number of lighting circuits. It requires the addition of a two-core control cable, daisy-chained to every light fitting from the dimmer controller. Its benefit is that the one control cable can be used (via addressing) to control many illuminares. DMX (Digital Multiplex) is the defacto standard for the night club and entertainment industry. It's used to provide dynamic movement of light, colour and dimming effects across a vast array of channels. Unlike DALI it was designed for colour and has a much higher speed of communications. As most entertainment and coloured architectural lighting is LED, DMX represents a good companion where coloured dimming is required. Originally used for controlling fluorescent ballasts, 1-10v is a simple and reliable system of dimming. It uses an analogue DC signal (0-10v) between the dimming controller and the LED driver. As the signal voltage changes so does the LED light output. No complex addressing setup is required just a 2-wire control cable run to each individually dimmable circuit.